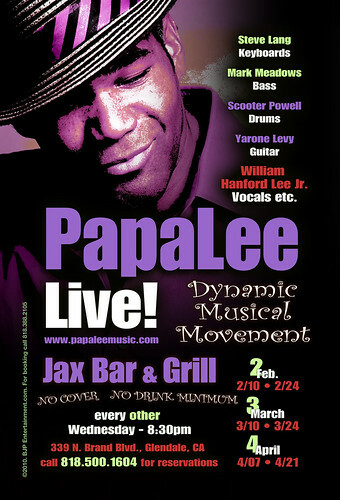 PapaLee Live At Jax Wednesday! It’s still Wednesdays and it’s still funky! PapaLee has been extended at Jax through the month of April. The dynamic musical movement continues with an amazing band and wonderful food and ambience. We are now starting at 8:30 pm and finishing at 12:30. We know… it’s a school night! The band will feature Steve Lang on keys, Mark Meadows on bass, Scooter Powell on drums, Yarone Levy on guitar, and William Hanford Lee Jr. on the m.i.c. Wednesday March 10th we’ll feature Romeo Bruné on guitar filling in for Yarone. Jax Bar & Grill is located at 339 N. Brand Blvd. in Glendale (at Lexington). Call 818.500.1604 for reservations. Here’s a RCA Small Wonder camera video of PapaLee performing at the Baldwin Hills Crenshaw Mall last Thursday. It is a clip of Thank You (forbreakinmyheart) being performed with Yarone Levy on guitar. THE ALBUM IS COMING IN JUNE! Enjoy the clip and subscribe to the channel on YouTube. PapaLee Live At Baldwin Hills Crenshaw Mall! 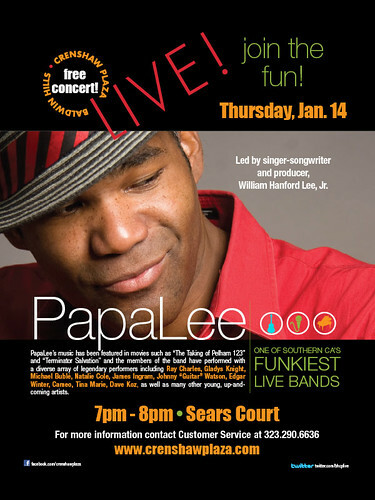 PapaLee is live Thursday evening at The Baldwin Hills Crenshaw Mall in the Sears Court. We will be performing from 7 – 8pm. The band will feature the usual suspects: Alonzo Scooter Powell on drums, Steve Lang on keys, Mark Meadows on bass, Yarone Levy on guitar; plus Hornlicious – Bijon Watson on trumpet and Louis Van Taylor on sax! Here‘s a link to show info on the mall site. I hope to see you there. Baldwin Hills Crenshaw Plaza 3650 West Martin Luther King Blvd. Los Angeles, California 90008 (323) 290-6636.